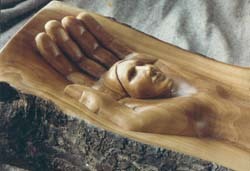 In 1979 I joined Vancouver's Ne Chi Zu Guild of woodcarvers and artists. In 1980, I co-founded the Ne Chi Zu Works co-operative: an innovative community centre including an art gallery, woodworking studio, soup kitchen and blacksmith shop. We created numerous pieces of furniture, signs, public and private sculptures including the 40' long 5' diameter carved maypole at Bathurst Quay, Toronto. In the summers, I planted over 300,000 trees in British Columbia's coastal inlets. Ben Barclay Woodworking first opened in Toronto in 1985 and has produced many fine pieces of creative furniture as well as kitchens, restaurant interiors, a 40' x 20' mural, fireplace mantels and architectural fixtures. Commissions have included stores for 'The Body Shop', and the flower garden highway sign for Metro Toronto. Beginning in 1990, I took three years off to be a stay-at-home parent, working part-time for Pollution Probe and Onward Willow Better Beginnings Better Futures Project. 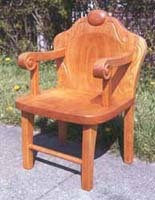 In 1994, I took on 6 employees to build a line of Cherry Mission furniture for a large Toronto retailer while continuing to produce custom pieces. Since 1999, with one apprentice, I design, build and sign each piece of furniture myself.